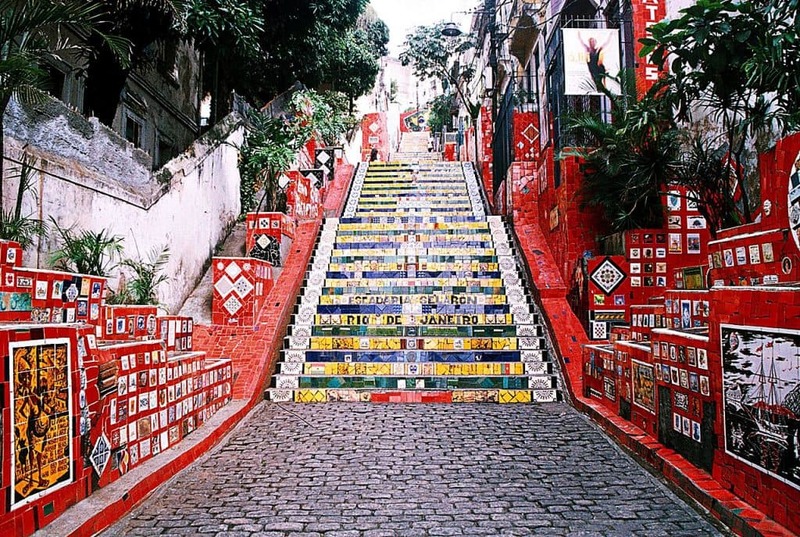 These are the 10 most iconic street art stairs throughout the world! This colorful geometric stair is a product of a small group of designers called Dihzahyners. Their name is taken from the phonetic spelling of designers in the dictionary. The group consists of recent design graduates in the Beirut area that meet once a month to create street art. Their goal is to create a more beautiful cityscape. Dihzahyners find their inspiration from blank spaces in their city and beautiful street art from others. The idea for a rainbow step emerged when a member posts a picture of #4 in this list, the Holsteiner Stairs in Germany. They found these blank steps and decided to make them beautiful. Because they are still a small group, they wanted to start with stairs and move on to bigger projects, like walls, later. It took the artists 8 hours to create the geometric pattern that runs across the entire staircase. The artists worked in rounds to complete the street art piece due to the extreme heat. They are completely self-funded and are looking forward to continuing their mission of making Beirut beautiful. The 16th Ave Mosaic Steps in San Francisco have become a popular tourist destination, but they were originally decorated as part of a neighborhood project. Led by artists Aileen Barr and Colette Crutcher, over 300 neighbors design the custom tiles that create the mosaic. They were also inspired by another stair on this list, #10 Escadarua Selaron. Found at the corner of 16th Avenue and Moraga Street, the iconic stair was funded by the San Francisco Parks Trust. Each of the 163 individual steps is as unique as the residents of the neighborhood! 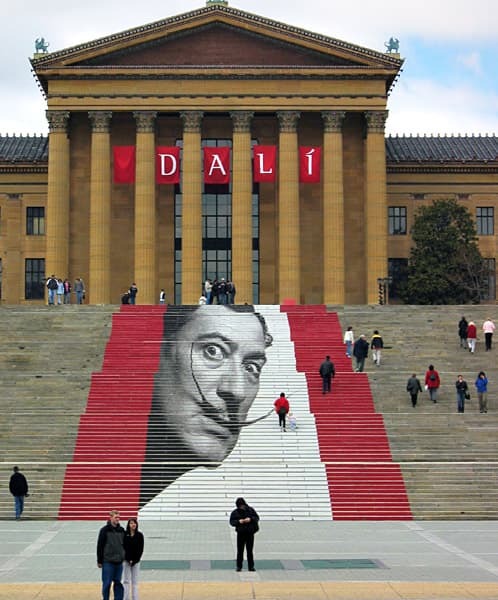 The Philadelphia Art Museum featured a Salvador Dali exhibit in 2005. The museum is home to one of the most iconic architectural structures in the city of Philadelphia, the Rocky Steps. They took advantage of the familiar sight by creating a giant advertisement for their exhibit. The museum took an iconic portrait of Dali and blew it up to billboard proportions. From there, they cut it into strips that were attached to the step’s risers. The overall image is projected across the 72 steps from afar. The Holsteiner Stairs in Wuppertal, Germany have been renamed in the general public as the Rainbow Stairs for obvious reasons. German artist Horst Glasker painted the steps with acylic paint, which he then titled Scala, the Italian word for staircase. 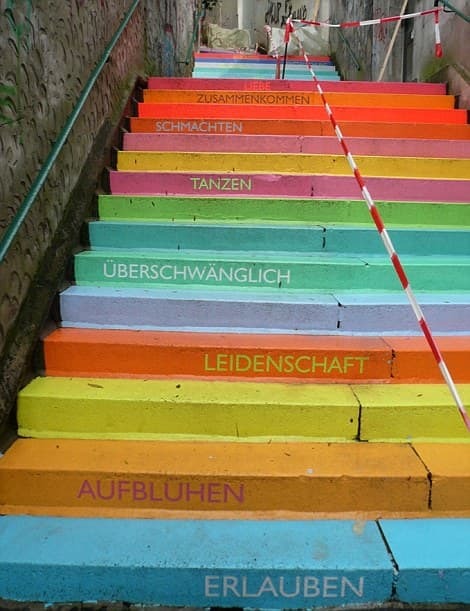 Each stair got its own color, creating the rainbow through the city that residents and tourists are so familiar with. The 112 steps each have a German word representing human relationships and emotions stenciled on them. The ranged from honor and innocence to rage and prohibition. 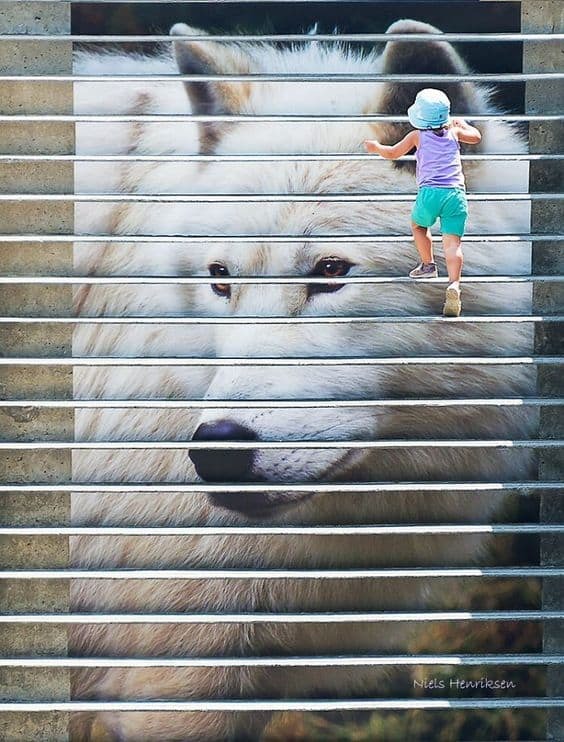 These stairs have become viral, inspiring the steps in #1 painted by the Dihzahyners. These stairs are different from the previous entries as they are a more conventional approach to art in an unconventional space. This mural is something you can easily see on a wall, but instead of one scene, it’s been broken into tableaus on the risers of each step. The artist didn’t spare any details in this beach scene. The image holds charm from the houses’ shutters to the waves in the shoreline. 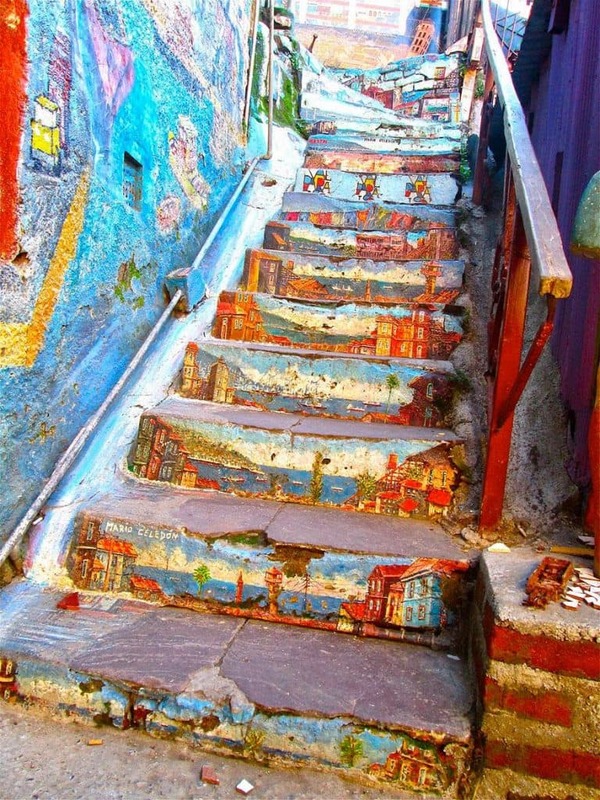 This old stone staircase is just one of many decorated stairs in Chile’s cultural capital. Other famous stairs include piano keys and color block steps. When you think of street art, you probably think of graffiti with spray paint. Maybe a mosaic for unique spaces, but folded paper is the last medium you would expect. 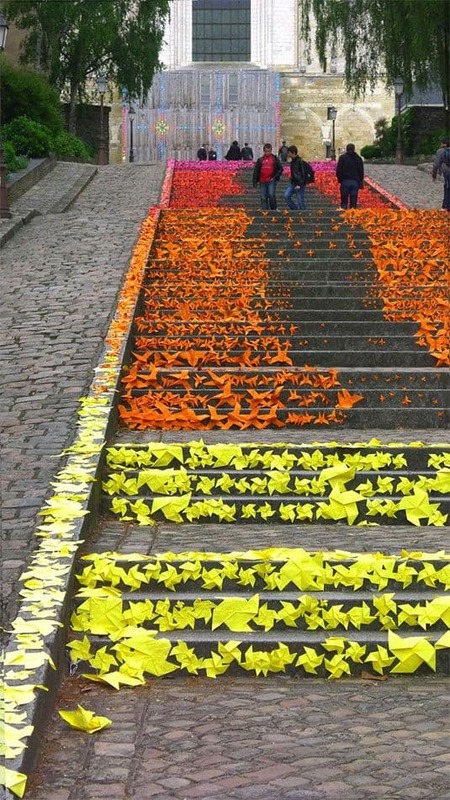 French artist Mademoiselle Maurice used the brightly color paper to decorate the stairs leading up to a cathedral. The installation was one of three origami designs that Maurice created for the 2013 ARTAQ Festival. The first was a portrait lining the river Maine and the second a geometric pattern on the fence of the cathedral. She enlisted the help of local residents, children, and inmates to create the over 30,000 pieces of brightly colored folded paper. This wasn’t the artist’s first foray into uncommon street art materials. Mademoiselle Maurice has also crated street art installations using lace. This piece wasn’t originally intended for stair art! Titled “White Wolf in Winterland,” the image was chosen as one of the winners of the Eco Art competition in Ottawa, Canada. Once the winners were chosen, the committee decided to display their artwork on the stairs leading up from underneath the Wellington Street Bridge in downtown Ottawa. This image was displayed on the stairs the same way the Dali portrait was in Philadelphia. The image was blown up to a large scale and then applied in strips to the risers of the stairs. The final product is a full picture from far away with an odd optical illusion when someone walks up the stairs. This stair features another odd use of materials in the name of street art. LEV, Laboratorio Escenico Visual, partnered with Converse to create this installation. LEV works to create thought-provoking arts installations in cities that interact with the city itself. By partnering with the shoe designer, they created different pairs of rainbow sneakers that were then used as planters. They staggered them across the steps at the exit of a park in downtown Santiago. 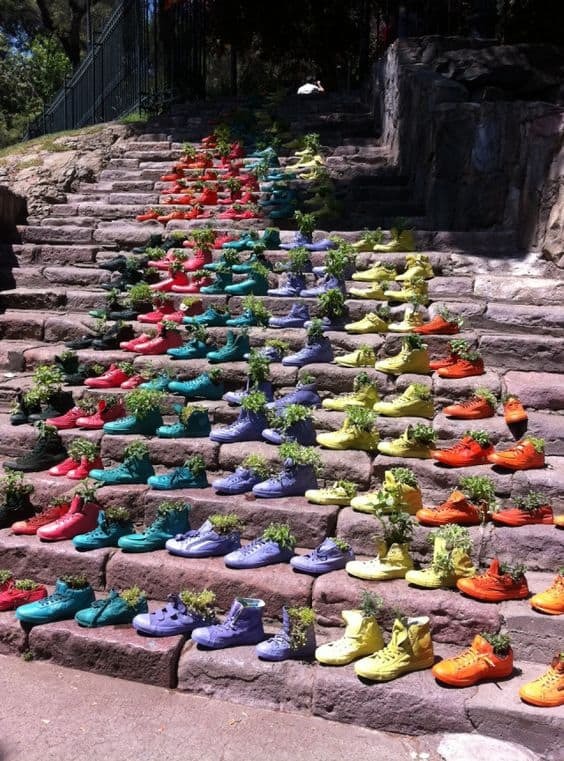 These brightly colored shoes bring life and color to an otherwise dull stone staircase. The Staircase of Santa Maria del Monte can be found in Caltagirone, Sicily. The 142 step staircase is often decorated according to the local festivals. Because of its monumental size, it is a natural centerpiece for all cultural events. It also connects the higher and lower parts of the city, meaning it is well traveled by locals and tourists alike. This particular picture was taken during the La Scala Flower Festival. 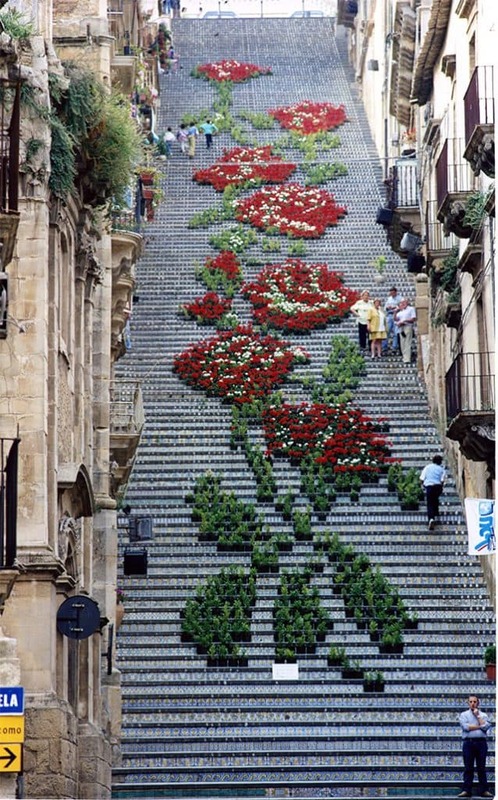 The image is made up of living plants that are strategically placed to create the image of roses leading up the staircase. During the Scala Illuminata Festival the stairs are decorated with candles to create dynamic images. Throughout the year, the stairs are typically decorated with images of patron saints. The Escadaria Selaron is an incredible centerpiece to the city of Rio de Janeiro. Each of the 215 steps have unique tiles. The artist, Jose Selaron, used green, blue, and yellow tiles to connect the stairs to the Brazilian flag. He often referred the stairs as “my tribute to the Brazilian people.” He began the project in 1990 when he noticed the plain stairs in front of his home. The mosaic features over 2,000 tiles. While he self-funded the project in the beginning, as the staircase gained popularity, tourists began to bring Selaron tiles from their home countries. He hand painted over 300 of the tiles with his own images. When he would finish on section of the stairs, he would move on to the next saying his work will never be complete. 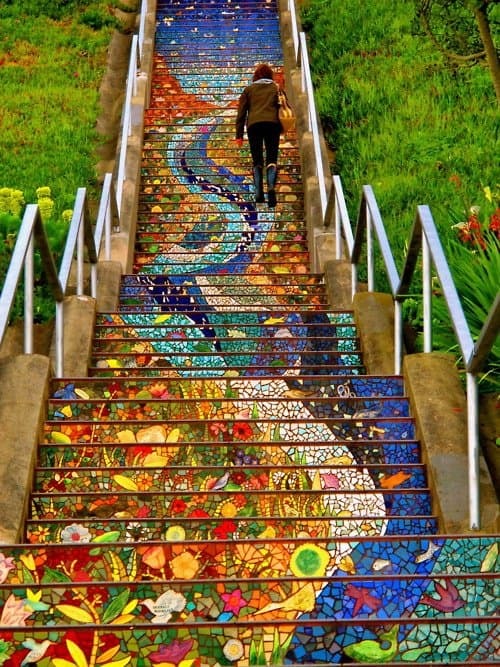 This famous street art stair inspired the 16th Ave Mosaic Steps in San Francisco. They share a common goal of locals making their neighborhoods beautiful. Stairs are a necessary part of any city's infrastructure, but that doesn't mean that they are limited to a basic design. 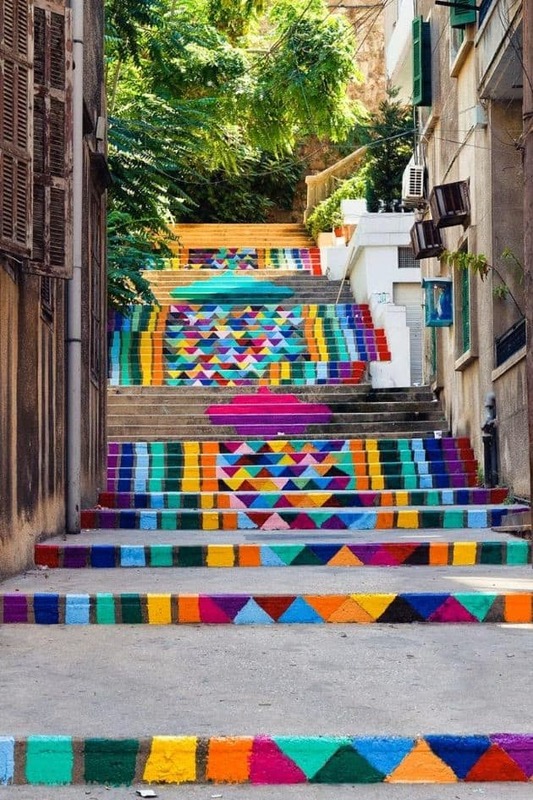 While many cities use simple concrete and metal to create their public staircases, these stairs are another level of street art. The artists decided to create fixtures in their cities to inspire residents and visitors alike.